In Dynamics 365 it is easy to assign cases, opportunities, etc. to a Team. This is a very convenient feature and when working with the built-in charts and dashboards, all the charts nicely puts either the team or user name on the legend, depending on what type the owner happens to be. However, Power BI doesn’t play so nice right off the bat. The reason for that is that the owner field in Dynamics 365 can point to either the User table or the Team table. That means you will need to let Power BI know which table to look at for each record. As always, there are many ways this challenge can be resolved, but I would like to highlight a few ways that I’ve been working with. The most important part of this post is simply to recognize that Power BI behaves in this way, and act accordingly. Otherwise, you may end up with weird looking visualizations, or worse, a wrong understanding of what your data really looks like. I’ll use the Case entity as an example as it is commonly assigned to both users and teams. The most simple approach is to add two extra fields on the Case table. One to indicate if ownership type is “User” or “Team”. The other with the name of the user or the team. The system name for the Case table is of course “incidents”, so that is what will be used throughout these formulas. 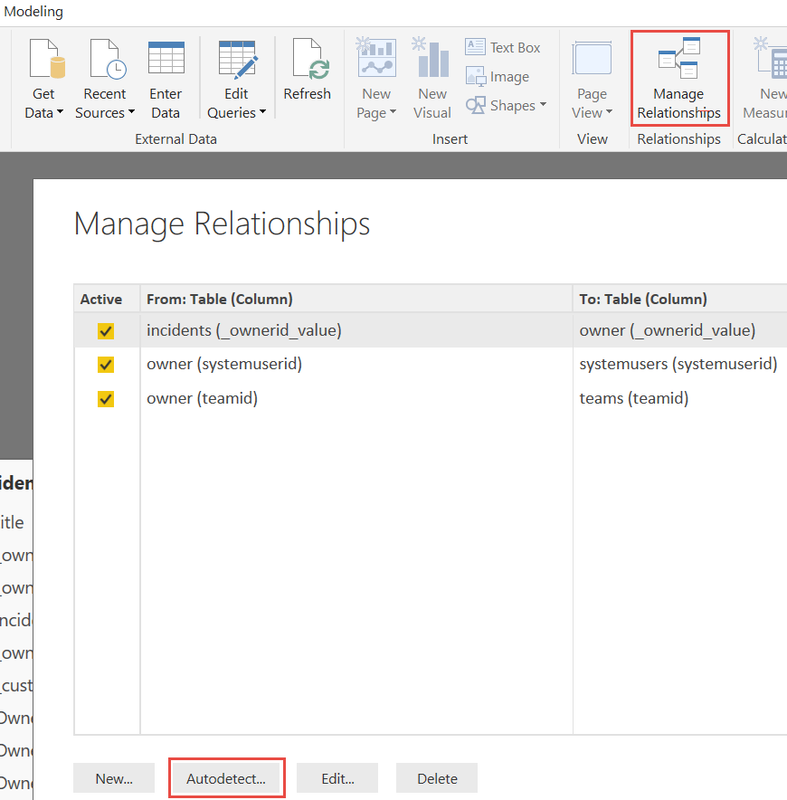 The examples assume no changes has been made to the column or table names in Power BI from when they were imported from Dynamics 365. Create a new column and enter this formula or copy and paste from below the image. It the field for the owning team is empty, the value will be set to “User”, if it has a value, it will be “Team”. This defines the ownership type. Create another new column and enter this formula. It is similar to the formula just used, but it inserts the name from the user table or team table instead. 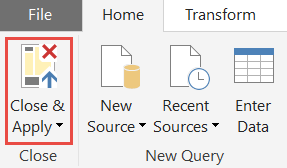 When entering this formula in Power BI, it would normally be on one line. I added line breaks so it is easier to read and to copy and paste from. Now, the two new columns can be used in visualizations so you can easily drill down on the specific type of ownership. Click to enlarge animation adding both columns. Rather than bringing the data in to the Case table, we can create one “Owner” table with all the users and teams in it, along with their unique ID in one column. This table can then be used for all the entities that have both user and team ownership. This method can also be used if you have more attributes on the ownership that you want to categorize by. For example, the manager of the user or the administrator of the team, can all be brought in to this table. To create this one table with ownership details, I will need to append the User and Team tables. The difference between “Append Queries” and “Append Queries as New”, is that “Append Queries as New” will create an additional table with our data that we can work with separately. 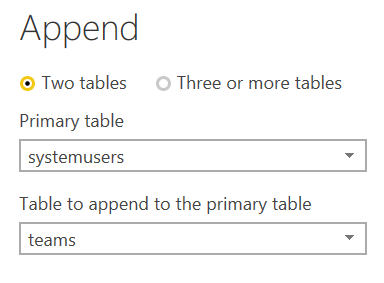 “Append Queries” will bring data in to an existing table. I am choosing the “as New” option so I still have the user and team table to work with separately if needed. In the dialog, select the two tables to append and click ok. Wait for tables to merge and rename the table from “Append1” to “owner”. Find the new Owner table and add two columns indicating the ownership type and the name of the user or team. Similar to the first method described, except simpler since all the values you need are now in the same table. One new column with the name of the user or team. One new column which contains the GUID of the user or team. I called this column “_ownerid_value”. Not the easiest to type, but it is the same as the schemaname for the mixed user/team owner field. Giving it this name will make it much easier for the autodetect relationships feature to give us some good results. At the end you should have these three new columns in your owner table. Finally, go to Relationships and add the relationship between cases and the new owner table matching _ownerid_value to _ownerid_value. Quickest way to do that is to drag _ownerid_value from incidents to the corresponding field on the owner table. Alternatively, click Manage Relationships and run the autodetect feature. Go back to reports and use the new owner table in some of your visualizations and verify that it is working. One consideration for this approach is that you double the amount of data in Power BI consumed by the user and team table. However, these are generally the smallest tables in a Dynamics 365 environments, so the impact is likely limited. I would be cautious of using a similar approach to handle the Customer field that can point to either an Account or Contact. With the DAX formulas used in Power BI, there are always options to make it more advanced. In my first example, I imported both the user ID and the Team ID into the cases table and based my logic in the DAX formula off of those. I could have imported only the one ownerid and have had the DAX formula base its logic on the content of the user and team tables, rather than the extra columns within the same table. That will save a few columns when importing data and you’ll have fewer columns to navigate. The DAX formula that brings in the Team or User name, with the logic based on data from other tables would look like this. Thanks for reading, and as always, please follow me on Twitter Follow @CRMChartGuy and sign up for my email newsletter to get the latest tips and tricks to get the most out of your Dynamics 365 data.